6. 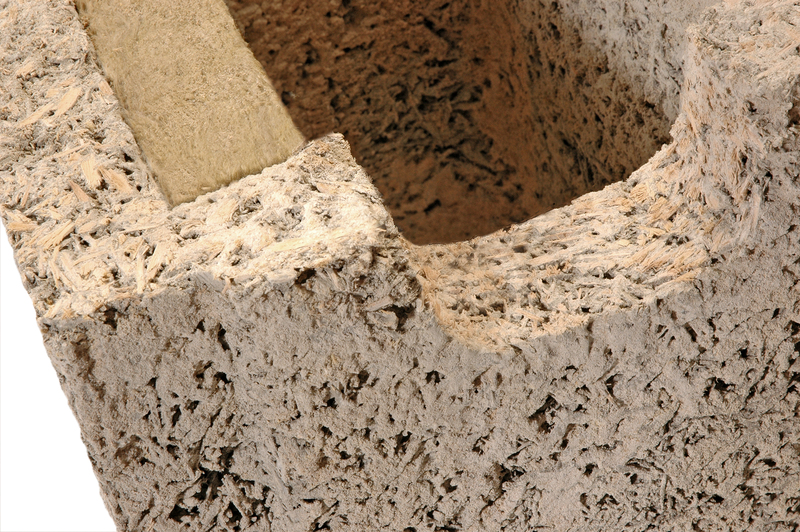 What is the true thermal performance of our insulated concrete forms? These two characteristics combine to create a wall system with excellent control of heat loss and heat gains. North American housing has been dominated by wood framed systems since World War 2. As the need to improve thermal Performance became more widely recognized, thermal insulation was added to the building enclosure. Codes, standards, and testing procedures were subsequently eveloped to ensure minimum thermal performance. Thermal performance Requirements and testing became biased toward lightweight framed systems, and rational means of assessing alternative systems were not widely adopted because of the limited number of such systems available. The R-value method of assessing thermal performance had value when proposed not because it was absolutely correct, but because it provided a means to compare otherwise similar wood framed wall systems. This situation is rapidly changing as the building industry seeks new and innovative ways of building, ways that are truly energy and resource efficient, economical and durable. Many different types of building systems are now being used throughout North America, requiring the development of more realistic means of assessing their true thermal performance. Although the Nexcem Wall Form System is not a new system, its thermal performance cannot be fairly assessed by the simple methods of the past. This report will present a more realistic assessment of the thermal performance of the Nexcem Wall Form System by accounting for thermal bridging (i.e., 2-D effects) and thermal mass. These benefits will then be discussed in the context of the most modern energy code available, ASHRAE’s proposed revision to Standard 90.1. Nexcem and framed wall systems are not simple one-dimensional assemblies. Real buildings are three-dimensional, with corners, window openings, etc. However, most wall R-value calculation methods, and almost all marketing brochures, do not factor in the effects of framing at windows, doors, corners, etc. Thus they tend to over-estimate the true thermal performance. The March/April 1997 issue of Home Energy Magazine presented the results of detailed analysis of whole houses conducted by researchers at Oak Ridge National Labs. The researchers concluded that the true R-value of all framed systems was substantially lower than that commonly quoted. For example, they found that a wall system with 2×6 studs at 24” on center and R19 batts had a true “whole wall” R-value of 13.7. This reduction reflects the fact that stud walls are typically 75% insulated cavity, 21% studs, plates, and sills, and 4% headers. Steel stud walls fared even worse, since the metal is so conductive it easily short-circuits the insulation. A metal stud wall with 3-1/2” deep studs filled with R11 batts was found to have a real R-value of only 7.1. The construction details that increase heat flow through a framed wall system have little or no influence on the heat flow through the Nexcem Insulated Wall Form System. Nexcem Wall Forms are designed to ensure that the R-value through the core of the wall is almost the same as that through the web. This not only avoids short-circuiting,it ensures uniform wall temperatures with no cold spots to encourage condensation, create discomfort, or cause dust marking. Several combinations of insulated Nexcem Wall Forms and a standard 2×6 wood framed wall were analyzed using the widely recognized and accepted FRAME two-dimensional steady-state finite volume heat transfer computer program. The standard ASHRAE values for conductivity were used for all materials except Nexcem. The Nexcem conductivity value was based on test reports from a national laboratory per ASTM standards. It should be noted that the analyses below are based on “clear wall” samples. As discussed above, corners, partition wall intersections, floor joists, and windows greatly increase the number of thermal bridges in standard 2×6 construction, but not with the Nexcem Insulated Wall Form System. The results of the analysis are presented in tabular format, with the nominal U- (overall transmittance) and overall R-values, followed by the same values through the middle of the core or stud space, and through the web or wall framing. The final column is the total (i.e., actual clear wall) value. Comments: There is almost no difference in R-value between the web and the center of the unit in these highly insulated Wall Forms. As a result, the temperature across the inside face does not vary by more than 0.2 degree Fahrenheit under design conditions. Comments: There is a large difference between the R-value through the framing and the middle of the batt. This causes a relatively large temperature difference of 2.5 degrees F across the interior face. The coldest temperature is 64.8 degrees Fahrenheit, 2.3 degrees colder than the coldest spot on the Wall Form with a 3” insert. Comments: The performance of the 10″ Wall Form is similar to the 12″ in terms of uniform surface temperature, amount of thermal mass, etc., but the total heat flow is higher because less supplemental insulation is provided. The coldest surface temperature for the WF25-5 insulated form is 66.5 degrees Fahrenheit, considerably higher than the 2×6 wall system. Comments: Even with no additional insulation, the Nexcem Wall Form provides uniform interior wall temperatures. The 8” concrete core provides a significant amount of thermal storage mass, and the capacity to resist very high structural loads. Materials like concrete, brick, and Nexcem have a high heat capacity, that is, they can store a significant amount of heat or “cool”. This material characteristic has long been known and was taken advantage of by ancient builders of adobe walls, sod roofs, and brick buildings. After many years of neglect, the benefits of thermal mass, as the ability to store heat is called, are being rediscovered by mainstream builders and accepted by building codes, spurred on by studies of passive solar heating, passive cooling, and low-energy houses. The improved thermal performance provided by thermal mass is called the mass effect. Constructing walls, floors and fireplaces of high heat capacity materials results in a building with an abundance of thermal mass. The thermal mass absorbs and stores heat when the indoor air is higher and releases heat when the indoor air is cooler. This temperature moderating effect improves comfort, and can also greatly reduce space conditioning energy consumption. In the winter all modern buildings with double-glazed south-facing windows collect more solar energy when the sun is shining than they lose through the windows at other times. The more insulating the window (e.g., low-E and argon filled, triple-glazed), the more “free” energy is collected. However, if the energy that is collected during sunny hours cannot be stored for use during nights and overcast days, it is often lost to overheating of the house and ventilation. Thermal mass allows the free solar energy to be used by providing the energy storage required to level the peaks (sunny days) and valleys (cold nights). Thermal mass plays as much of a role as the use of quality windows in reducing heating energy consumption, yet it often costs less to provide this mass. Other benefits of thermal mass include the increased ability to survive heating system failures without discomfort or damage, and the ability to use smaller heating systems. The benefits of thermal mass are even more important in cooling climates and in heating climates during the summer. In most locations, the night-time air temperature is considerably lower than the day-time air temperature. This difference in air temperature can be taken advantage of by encouraging ventilating during the night, thereby cooling the thermal mass. As the temperature rises during the following day, the interior will remain cool. Although this use of thermal mass was widely employed thousands of years ago by, for example, the Anasazi Indians of Arizona, thermal mass is still a relevant and highly successful means of providing a comfortable interior environment with no supplemental air conditioning. Even in hot climates with warm evenings, major benefits can be had from a substantial downsizing in equipment and the shift of maximum cooling to the evening hours, when air conditioning equipment is more efficient and power can be less expensive. Thermal mass also acts to reduce the need for cooling by absorbing and storing solar energy that falls on walls. The thermal lag of a Nexcem wall is at least 8 hours, meaning that the maximum temperature on the inside occurs 8 hours after the maximum on the outside. The BSR/ASHRAE/IESNA Standard 90.1-1989R, has been widely used by individual states to govern the insulation levels of buildings other than single family dwellings. This standard is presently being revised and has reached the 2nd Public Review Draft – December 1997 stage. The new version is expected to be formally adopted sometime in 1998. The proposed standard provides large benefits for buildings with thermally massive walls and systems with little thermal bridging. The size of these benefits was based on the results of thousands of detailed energy simulations for many locations and wall assemblies throughout North America. for some representative cities are shown below. A 2×6 wood framed wall with a drywall interior finish and stucco exterior finish was shown earlier to have a calculated “clear wall” R-value of 17.9, but when the extra thermal bridging inherent in framing around doors and windows is accounted for, ASHRAE considers such a wall to have an R-value of 14.3. This value is still higher than that calculated by the Oak Ridge researchers (they estimate closer to R 12). Such a 2×6 wall system does not meet the requirements of the ASHRAE standard for residential buildings (U<0.067, R>14.9) in colder regions (7201-9000 HDD). The Nexcem 10″ with 1.5” of insulation (R13.8) easily complies for even colder regions (9001-10800 HDD) because of the substantial thermal mass benefits. Even the steady-state, no mass effect R-value of the same 10″ Wall form with 2” of insulation (R15.4) exceeds the requirements for these regions. Note: “is” denotes that the R-value must be provided by a continuous blanket of insulating sheathing. Typical Heating Climate Minimum R-value Requirements of Proposed ASHRAE 90.1 for Residential Buildings. In mixed climates (i.e., those that require some cooling and some heating), Nexcem wall systems can provide sufficient insulation, whereas all steel framing systems require some exterior insulating sheathing to meet the requirements of ASHRAE 90-R1. thermal mass and continuous insulation of Nexcem Wall Systems. climates with HDD < 12600 and any value of CDD.